There is no means of transport on a mountain quite so fast and dynamic as skiing. The feeling of freedom within a unique environment, the pure mountain air, of covering long distances with complete safety. 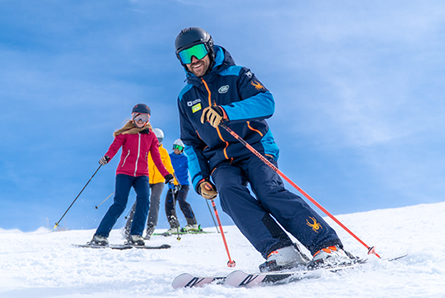 The Soldeu ski school has talented and experienced snow professionals for the purpose of helping you to become more confident, understand the terrain and to help the skier to fulfil his/her highest expectations. We want the visitor to be confident enough to do this and much more. Our professionals will share their experience amidst the more than 200 km of skiable slopes within the Grandvalira domain, in order for you to have an unforgettable experience. We have programmes which are adapted to the abilities and ages, and all classes have satisfaction guarantee. This is a risk-free experience which you will never forget, and we would like you to experience it at Soldeu El Tarter, Grandvalira. We hope to see you soon on the slopes! We have professionals from a range of nationalities. All of our instructors have official certifications at national and international levels. Also providing classes for adapted skiing, prior reservation, facilitating the use of special equipment which is free of charge for the classes. There is a School in every sector of the resort, upon arriving with the cable car. This is where you can find our facilities for the skiing and snowboarding schools, playschool, snow garden and nursery school. This is the starting point for all the classes, except for the one-to-one classes at 9 am which start at the foot of the cable car. We also open a point of sale at the foot of the slopes on the first day of the courses.